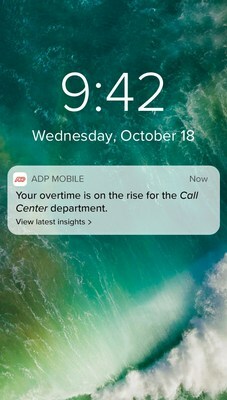 ADP has added an “Insights” feature to its Mobile Solutions app, allowing managers and business leaders to receive real-time workforce analytics while away from their desks. Using—what else—AI and machine learning, the feature continually tracks wage, time, location, industry, and other types of data to uncover trends and other insights that can be incorporated into management decision making. Powered by ADP’s DataCloud, Insights delivers analytics and provides competitive context through the company’s benchmarking tools, which draw data from 30 million employees of the company’s customers. Marc Rind, ADP’s chief data science, touted Insight’s ability to deliver information “in a conversational way” as a “game-changer for business leaders.” The feature’s greatest value, he said, lies in its ability to help management more precisely examine the performance of their workforce and identify areas with the greatest opportunity for improvement. Executive and Manager Insights consumerizes analytics by delivering analysis through easy-to-read headlines, ADP said. It analyzes client data to spot trends and patterns, such as which departments have the highest overtime or the locations where turnover might be spiking. Such insights can be shared by push features like email and text. The app allows users to customize notifications so they can receive daily or weekly snapshots. Sometime soon, the company said, location-specific features will be added. Over time, AI and machine learning are expected to help personalize the insights each user receives. Given the increasing value being put on the workforce-analytics market, the introduction of such features to ADP’s toolset shouldn’t come as a surprise. Transparency Market Research, for one, predicts the market’s value will reach $2.4 billion by 2026, pushed by increasing demands in compliance, operational efficiency and controlled workflow. In addition, the researcher notes, the dramatically growing use of mobile devices is increasing demand for mobile access to such information. Of course, ADP’s not alone in moving further into this market. Beeline, Cornerstone OnDemand, Kronos, Oracle, PeopleFluent, SAP SuccessFactors, Tableau and Workday are all pursuing their own initiatives.